Be sure to view the Benefits of IPF and Power of IPF pages to see details about the unique features of our program. We also have gift certificates available. The prime service of the Integrated Personal Fitness (IPF) program is comprehensive, private one-on-one personal training sessions with a wide variety of exercise modes and activities. Personal Training - Personal training is one-on-one or small group fitness instruction that incorporates the client's health history, fitness goals and current lifestyle into a comprehensive exercise program designed to meet the client's specific needs. A nationally certified personal trainer will introduce, demonstrate, and supervise proper technique on a variety of exercises while providing motivation to achieve the client's goals. Many of the modes and activities that can be folded into your fitness sessions are listed below. 1. Scheduling/Contact Us -Simply contact the fitness staff at the following number or e-mail address to schedule a fitness session. 2. Payment -Payments for the fitness program are handled by establishing a prepaid line-of-credit. 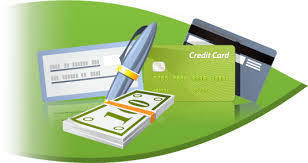 Prepayments can be made by credit card, cash, or check. 5. Muscle Imbalance and Fitness Assessment- This fitness assessment is performed for all participants of the Integrated Personal Fitness Program. The fitness assessment will include: instruction on foam rolling, body circumference and weight measurements, body fat percent estimate, an assessment of balance, stability, strength and endurance for the major muscle groups and give an indication of any potential muscle imbalances across the primary joints. 6. Fitness Nutrition Consultation - Basic fitness nutrition consultation includes a review of proper macronutrient proportions, meal size and timing, personal daily calorie targets and tracking, properties of major foods and tips for meeting your targeted intake. 7. Corrective Exercise Training - The systematic process of identifying a neuromusculoskeletal dysfunction, developing a plan of action and implementing an integrated corrective exercise strategy. This often results in better posture, a reduction or prevention of joint and muscle issues and a general improvement in body movement. 8. Flexibility Training - This training seeks to provide for the normal extensibility of all soft tissues to allow the full range of motion of a joint. This includes the release of tissue with pressure and proper stretching processes. A more complete range of motion not only help increase the effectiveness of other training modes but it also helps to avoid injury and helps with day to day tasks. 9. Cardio respiratory Training- Commonly termed "Cardio"�, this aspect of training places a stress on the cardiorespiratory system in order to allow for your body to adapt and increase it' s cardiorespiratory efficiency. The cardiorespiratory system involves the heart, blood vessels, lungs and breathing passageways. Of course improvement in the cardiorespiratory efficiency will provide for more capability in all other taxing activities. 10. Core Training - The core is where the body' s center of gravity is located and where all movement begins. The core operates as an integrated functional unit to stabilize the body' s movements. The body' s core has to be operating with maximal efficiency to effectively use the strength, power, neuromuscular control and muscular endurance that has been developed in the rest of the body. Core training develops the deep muscles of the core required for effective stabilization of the body. 11. Balance Training - Balance training fills the gap left by traditional training. It focuses on movement requiring many sensors in the body to deal with a safe but unstable environment. Improvements as a result of this training provides for a more safe and complete muscle firing pattern, which is required for joint stabilization and muscular control. 12. Reactive, Power, or Plyometric Training - This training uses quick, powerful movements involving muscle contractions in one direction quickly followed by an explosive contraction in the other direction. Clients must have developed proper core strength and balance before making full use of this training. This training helps most in functional activities needing maximal force output in a minimal amount of time, typical in a sports activity. 13. Speed, Agility, Quickness - We refer to speed as a straight-ahead speed, agility as short bursts with change of direction and quickness as the ability to react to a situation and change one' s motion. Often referred to as SAQ, this training not only has benefits in athletics but it better prepares all clients for unusual situations, such as emergencies, that commonly occur in day-to-day life. 14. Resistance Training - This training makes use of the body' s incredible capability to adapt in order to increase its functional capability. Most commonly the adaption is a result of lifting a weight but it can come in many forms. Resistance training is NOT just for body builder types. Everyone can benefit greatly from resistance training. Increased bone density and tissue strength are some of the benefits from resistance training that cannot be gained as efficiently by other means of training. 15. Whole Body Vibration - As a whole body vibration platform vibrates, it increases gravitational force on the body. The body responds with thousands of reflexive contractions per minute, as well as positive adaptations in connective tissue, neuromuscular efficiency, bone density, hormonal response and physical capabilities. We have one of the largest vibration plates in production. 16. Zumba - Zumba combines high energy, motivating music with unique moves and combinations that allow the Zumba participants to dance away their worries. It is fun, easy to do, great for the body and great for the mind. It is a 'feel happy' workout. 17. Water Fitness (Aqua Aerobics) - Seasonal. Water Fitness uses the buoyant qualities of water to enhance physical fitness through exercises. It is low impact and designed to provide cardiovascular conditioning, improved muscle tone, and improved balance. It is a total body workout without the stress of land-based exercise. You do not have to be a swimmer. 18. Pilates and Yoga - Low impact, yet highly controlled workout that will improve your balance, strength and flexibility as well as burn calories, promote weight loss and visibly improve muscle tone with regular practice. 19. Pickleball - If you want to learn what Pickleball is, let us know. 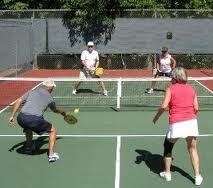 We can introduce you to the sport or just have an active Pickleball session if you already play. Pickleball is quickly growing into a widely loved sport with the Bay Area as one of the more popular spots for the sport. Pickleball uses a large paddle and a perforated plastic ball on a court about the size of the forecourt of the tennis court. The sport is easy to learn and can be played by a very wide range of fitness levels and capabilities.